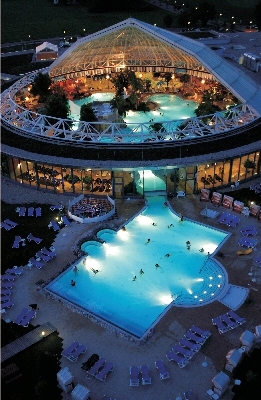 the Therme Erding, Europes biggest Hot Water Spa World. Thermal waters and mineral waters are characterised by higher temperatures respectively by elevated dissolved mineral contents. Thermal waters are natural waters above the threshold of 20°C. Thermal waters can be used for spa treatments or, at temperatures of more than 40° - 50°C for geothermal heat or electricity production (Geothermal Energy). Thermal waters usually feature a higher amount of mineral solutes. Mineral waters are generally defined as waters with total dissolved solids (TDS) of more than 1 g per litre (although in France less mineralized waters may be labelled "eau minérale"). Mineral waters are used in spas or in the beverages industry. In the Molasse basin and the Po basin no high enthalpy systems exist. Thermal water, thus, occurs only at great depths, but might reach shallower levels when tapped by deep reaching faults. Generally, the fault network of the subsurface provides the principal migration path for thermal and mineral waters at depth. The successful exploitation of thermal water thus requires encountering these fault and fracture systems. Within the objectives of GeoMol, the extent, depth, and thickness of thermal water reservoirs will be mapped, including the temperatures at different depths. A 3-dimensional model of the temperature distribution and the array of the principal fault network (implemented at least for the pilot areas) will help to locate developments and to avoid mutual interferences or overexploitation. Available data on permeability and porosity of the reservoir rocks will be compiled.